2018 3MT Western Finalists Announced! Two CEE researchers have been named Canada Research Chairs (CRC) - Robinson & Bitsuamlak. A group of Western University engineers are replicating high-wind conditions to learn how to build structures that can withstand the worst windstorms. . .
CEE graduate student Ahmed Abuhussein recently spent five months in the west African country of Ghana where he addressed gaps in applying treated wastewater in agriculture at city level. The Engineering Institute of Canada (EIC) announced recently that Professor Ashraf El Damatty, Chair of the CEE Department has been inducted as an EIC Fellow..
Moving forward, all municipalities in Prince Edward Island (PEI) developing new subdivisions will now be required to use a tool created by Western professor Slobodan P. Simonovic for incorporating climate change as part of their design and site evaluation processes.. When it comes to problems related to wastewater treatment, water resource management and groundwater remediation, Western University’s researchers are leading the way in finding the answers. A professor’s exceptional contributions to the field of civil engineering has earned him recognition by the Canadian Society for Civil Engineering (CSCE). Ashraf El Damatty, Professor and Chair, Department of Civil and Environmental Engineering, is the 2016 recipient of the CSCE Horst Leipholz Medal. The CSCE Horst Leipholz Medal is presented annually to a civil engineer who has made exceptional contributions to engineering mechanics research and/or practice in Canada. The Structural Engineering Institute of ASCE is proud to announce the winners of the 2016 O.H. Ammann Research Fellowship. The Ammann Fellowship is bestowed annually to a member(s) for the purpose of encouraging the creation of new knowledge in the field of structural design and construction. Amal Elawady, supervised by Dr. Ashraf El Damatty, was one of this year's recipients. Western Engineering has partnered with the Ontario Science Centre in their newest exhibit: Wild Weather. The Canadian Geotechnical Society recognized Professor Hesham El Naggar, PhD’94, recently by presenting him with the Geosynthetics Award. This award is presented biannually by the Society for outstanding publications in the application of geosynthetics to civil, geotechnical or geoenvironemental engineering. Western Engineering professor Greg Kopp has been breaking things in the name of science. Engineering professor Greg Kopp has been breaking things in the name of science and, more importantly, the name of safety for the past decade at the Insurance Research Lab for Better Homes. Code and policy changes for better residential and commercial structures have resulted in safer dwellings across the country. CEE professor Jason Gerhard receives 2016 R. Mohan Mathur Award for Excellence in Teaching. Dean Andrew Hrymak announced recently that the recipient of this year's R. Mohan Mathur Award for Excellence in Teaching is Dr. Jason Gerhard, professor in the Department of Civil & Environmental Engineering. The R. Mohan Mathur Award is presented annually to an outstanding Western Engineering faculty member to recognize his or her exceptional contributions to university teaching and the promotion of academic excellence amongst our students. The Ontario Society of Professional Engineers and Professional Engineers Ontario have recognized Hesham El Naggar’s dedication to the engineering profession with the 2015 Ontario Professional Engineers Awards Engineering Medal: Research and Development. Western Engineering professor Denis O’Carroll is assisting Environment Canada’s policy decisions around the pros and cons on certain engineering nanoparticles. For his work attempting to answer these unknowns, O’Carroll was recently recognized with a Natural Sciences and Engineering Research Council of Canada Strategic Project Grants ($510,185/three years) to find answers urgently needed by policy-makers..
Department of Civil and Environmental Engineering Chair Ashraf El Damatty has recently received national and international recognition by the Canadian Society for Civil Engineering (CSCE) and the Wind & Structures: An International Journal. Watch how Western Engineering researchers are working to create solutions for the management and treatment of water supplies, and the remediation of wastewater. 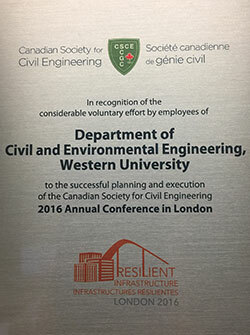 Ashraf El Damatty, Civil and Environmental Engineering chair, has been elected a Fellow of the Canadian Society for Civil Engineering (CSCE). El Damatty will be presented this honour at the CSCE Annual Conference awards banquet, held at the Halifax Marriott Harbourfront Hotel on May 30. They designed. They built. They raced. This month, Western hosted 450 students from Canada's top engineering programs at the 40th annual Great Northern Concrete Toboggan Race. Ashraf El Damatty, along with Engineering professors Eric Savory, Horia Hangan and Girma Bitsuamlak, eight graduate students and two postdocs, have initiated a research program with Hydro One to mitigate future failures of transmission line structures during severe weather strikes. Western Civil and Environmental Engineering professor Ernest Yanful is confident residents of remote African villages will be able one day to pour clean drinking water. The opening of the Kwame Nkrumah University of Science and Technology (KNUST) Institute of Sanitation and Waste Management in Ghana, in which he had a major role, is the first step toward that goal. Election to the Canadian Academy of Engineering (CAE) is one of the highest professional honours accorded to an engineer. On June 20, Civil Engineering professor Slobodan Simonovic joined the accomplished list of CAE Fellows at the induction ceremony in Montreal, QC. Think concrete can’t float? The Western Engineering Concrete Canoe Association (WECCA) has come together to prove you wrong – and build a concrete canoe to compete at various competitions across Canada. Western Engineering students Rob Volcko, Thomas Zolis, Emily Keyes, Marco Furano and Arthur Gonzales placed first overall in the university category of the Connections Competition at the Ontario Centres of Excellence (OCE) Discovery Conference in Toronto this week. The team, who partnered with the City of London, presented their fourth-year design project of a cable-stayed pedestrian bridge at Talbot and Bathurst streets. Students are traveling to locations such as Africa, China, Germany and more. Some students are traveling with Engineers Without Borders while others are participating in research opportunities, conferences and/or the WE Go Global certificate. As an undergraduate student, Matt Johnson, BESc’11 (Civil Engineering with Technological Entrepreneurship Certificate) jumped feet first into the best student experience at Western; his feet have remained there ever since. Western Engineering rugby player Conor Trainor's athletic career was honoured at the 2012-13 Western Mustangs Athletic Awards Banquet at the London Convention Centre. The Western Engineering Toboggan Team (WETT) took home first place at the 2013 Great Northern Concrete Toboggan Race (GNCTR) hosted in Vancouver by the University of British Columbia from Jan. 23-27. Mark Carney, BESc’08 (Civil), was part of an extensive team who installed Toronto's Concord Cityplace Skybridge in June 2012. The Western Engineering Toboggan Team unveiled their design on Jan. 8 for the 2013 Great Northern Concrete Toboggan Race to be held in Vancouver Jan. 23-27. The team also team performed three test runs on University College (UC) Hill. The theme for 2013 is WETT Vikings and the team will be sending 30 members to the competition. Western University will host the 2014 race in London at Boler Mountain. For more information on the race, visit www.gnctr2013.com/. For photos of unveiling and test run click here. Congratulations to all of our Big Beam team members for their successful participation in the PCI Engineering Student Design Competition, also known as "The Big Beam Competition". Team Members Left to Right: Muhammad Diab, Mohamed Monir, Jason Daplyn, Eric Morin, Aiham Adawi, Zixiao Wang, Ahmed Elansary, Zach McNeil, and Yamen Elbahy (missing members: Ahmed Musa and Jerad Harnish). First place. Sigma Innovations: Jason Speir, Sylvia Broschinski, Codie Crockford, Katheryn Madonia and Phillip Santana for their design of a footbridge at Harrison Park over the Thames River. Second place. RDA Consulting: Tara Chevrier, Joel Donkervoort, Kristopher Mandeville, Lindsey Mitchell and Nemin Zhu for their design of a footbridge at Harrison Park over the Thames River. Third place. McENN Inc.: Colin Schmidt, Nicholas Agam, Emanuel Benyamin, Marsha Cooke and Natasha Lee for their design of chemical treat system at Greenway Pollution Control Centre. 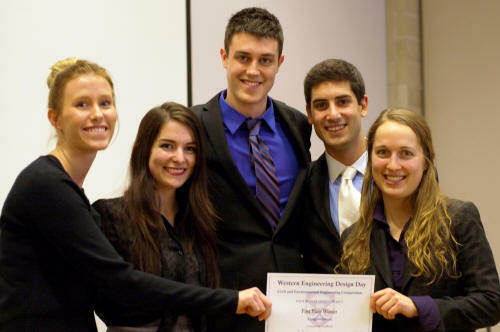 Congratulations to all groups who presented their design concepts at the 2012 CEE Western Engineering Design Day Competition on Friday, February 10, 2012. The judges were impressed with the continued high caliber of the designs presented by our students. The first place prize this year was awarded to Sigma Innovations (Jason Speir, Sylvia Broschinski, Codie Crockford, Katheryn Madonia, Phillip Santana) for their design for a pedestrian footbridge at Harrison park over the Thames River. Second place was awarded to BREWT Consulting (Hendrik Westerink, Samantha Barnes, Kathleen Edwards, Michelle Rivers, Bill Terry) for their design for a VMP Flyover at River Road to serve pedestrians and vehicles. This group was also awarded the Demarco Green Technologies award for the sustainability aspects of their design. Third place was awarded to RDA Consulting (Tara Chevrier, Joel Donkervoort, Kristopher Mandeville, Lindsey Mitchell, Nemin Zhu) for their design for a pedestrian footbridge at Harrison park over the Thames River. 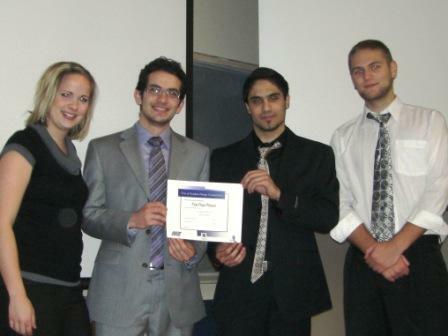 For descriptions of all the different design projects please visit our website: http://www.eng.uwo.ca/civil/undergraduate_program/CEE441_projects.htm. Alexandra Bruce, a student who completed her second year of studies in Civil Engineering at Western before taking a break to prepare for the Pan Am Games, has won a gold medal in women's doubles in badminton. Alex return to Western in 2012 to complete her Civil Engineering degree. Conor Trainor, fourth-year Civil Engineering, and Reid Halpenny, BES'11, will also compete at the games this week. Trainor in Rugby and Halpenny in Volleyball. Spencer is working in Zambia from May to August with Engineers Without Borders Canada in the agriculture value chains sector. For more information about the program and our students please check out their website. Congratulations to all our student teams for a very successful afternoon on March 4, 2011 -- the presentations for the City of London Design Competition were all excellent. The judges were impressed with the quality of submissions this year. The Department of Civil and Environmental Engineering is pleased announce and congratulate this year's winners of the department's WEDD Competition which was help on Friday, February 18, 2011. Two second place prizes of $200 went to design teams RGL Consulting Engineers Muhannad Bagajati, Leanna King, Aaron Mohammed Philip Spencerand Demetrios Vaiopoulos for their design for the removal of the Hunt Weir; and SWIFT Consulting Kyle Gilbertson, Bernard Kim, Nathan Madigan, Myles Swift and Kim Van Andel for their design of a pedestrian footbridge over Sunningdale Rd. The Department of Civil and Environmental Engineering is pleased announce and extend congratulations to the instructors of 2009-2010 who have received USC Teaching Honour Roll Certificates. Based on information received from the course and teacher evaluations, this award is presented to the most outstanding teachers on campus. Professors that receive an accumulated average of 6.3 or higher out of 7 on the first 14 questions of the evaluations are recognized with this award from the University Students' Council. Environment geotechnical engineer Prof. Fred Kulhawy (Cornell University) provided a fascinating journey through the “Past, Present, And Future Use of Underground Space” to a packed audience at Western’s Faculty of Engineering on the afternoon of Thursday, September 23rd. This presentation was part of the 2010 WE Distinguished Lecture Series. The presentation provided an overview of a very important concept that Dr. Kulhawy stressed needs to be embraced more readily by engineers, architects, geologists, planners, and others concerned with the constructed environment; the creation and development of underground space. His talk began by posing challenges for the future followed by a brief history of how underground space development occurred, citing both the usages and the advances in technology. Examples were shown of worldwide applications over a broad spectrum of human activities. This light and lively talk was very well received by the audience and posed a number of profound questions for the industry to ponder. Dr. Fred H. Kulhawy is an internationally-known educator, researcher, and consultant with over 45 years experience in geotechnical engineering. He has lectured and practiced around the world, and his seminal research is widely known and adopted. Congratulations to all our student teams for a very successful evening on February 26th -- the presentations for the City of London Design Competition were all excellent. The judges were impressed with the quality of submissions this year. Left to Right: Andrei Shevchuk, Teresa Brown, Nolan Danard, Amro Miqdadi. 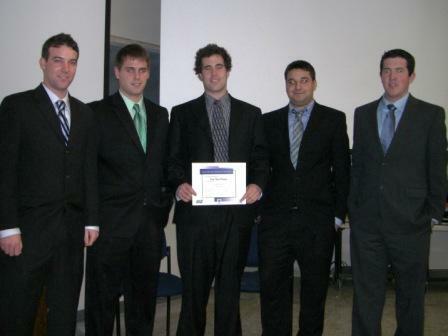 Left to Right: Scott Bushell, Clarke Campbell, Matthew Marttila, Matthew Esposito, Rory Doherty. Congratulations to all the students from A.B. Lucas, H.B. Beal, and London Central Secondary Schools who entered their bridges in this annual event hosted by the Department of Civil and Environmental Engineering and the student group Western Society of Civil Engineering (WSCE). The night was full of a polar stick splintering fun and excitement as more that 20 bridges constructed of polar sticks (donated by Nestle Canada), dental floss (donated by the Faculty of Dentistry) and a bottle of white glue were stressed to destruction. There were a number of good entries, said Civil engineering professor Mike Bartlett, "but the winners put the most thought into their designs and the most care into the construction of their bridges." Win or lose, it's a fun thing to do and a good learning experience, he said. This year's Best Overall Bridge which held 250kg a weight 262 times its own weight was constructed by Nicole Ginzel of H.B. Beal SS. She also took home the prize for the Best Bridge by an Individual Student. The prize for the Best Bridge by a Student Team went to Hannes Filler, Monan Wang, and Matthew Ng from A.B Lucas SS. Their bridge, Atlas held 200 times its own weight. Sophia Liu and Shirley Yuan's, The Little Boulder, took home the prize for Most Aesthetically Pleasing Bridge. Congratulations are extended to our own Dr. Ashraf El Damatty for receiving the Alan H. Yorkdale Memorial Award for his paper titled “Behavior of Partially Grouted Reinforced Masonry Shear Walls – Experimental Study” published earlier this year at the 11th Canadian Masonry Symposium. The Alan H. Yorkdale Memorial Award is presented not more frequently than once a year to the author or authors of the best paper concerning clay shale, concrete, or sand-lime masonry published in the English language. The award, established in 1987 by Committee C15 on Manufactured Masonry Units, honors Alan H. Yorkdale, , former Secretary of C15, member of Executive Committee of C15, Chairman of C15.02 for 18 years and a leading proponent of the advancement of masonry engineering and research in his 27 years of service with the Brick Institute of America. This award is financed through voluntary contributions by ASTM Committee C15 members and other organizations. Congratulations are extended to our own Dr. Slobodan Simonovic for receiving the designation of Diplomate, Water Resources Engineer (D.WRE) from the American Academy of Water Resources Engineers (AAWRE). The Academy has conferred the Honorary Diplomate (Hon.D.WRE) status to 18 individuals and the D.WRE certification to 500 professional engineers. Each professional engineer has demonstrated the highest level of achievement in water resources engineering through their water resources engineering experience, advanced level of education, and contributions to the engineering profession. These individuals exemplify and embody the very best in the broad field of water resources engineering; from academia, public service, and private practice. AAWRE celebrate these outstanding leaders that have made significant contributions to the field of water resources engineering and leading by example in furthering AAWRE's mission to improve the practice, elevate the standards, and advance the profession of water resources engineering. 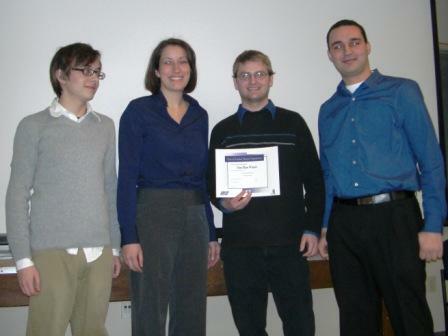 Left to Right: Kyle Howe, Eric Simon, Tiffany Palmer, Marcin Blazejowski, and Cameron Laffin of Cliffton Engineering; and Ryan Devries, Haider Ahmed, and David Williams (absent: Roman Elazar and Jennifer Francis) of Team Enviro Spirit. Congratulations to all our student teams for a very successful evening on March 3, 2009 -- the presentations for the City of London Design Competition were all excellent. The judges were impressed with the quality of submissions this year. Special congratulations to our two first place and second place winning teams: Cliffton Engineering: Marcin Blazejowski, Kyle Howe, Cameron Laffin, Tiffany Palmer, Eric Simon, Team Enviro Spirit: Haider Ahmed, Ryan Devries, Roman Elazar, Jennifer Francis, David Williams, Mifflin-Dunder Engineering and Associates: Alexandra Moore, Travis Parker, Jennifer Simich, Matthew Stead, Michelle Welch. 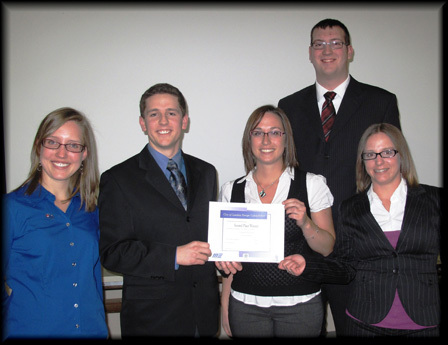 Left to Right: Alexandra Moore, Matthew Stead, Jennifer Simich, Travis Parker, Michelle Welch of Mifflin-Dunder Engineering and Associates. The Department of Civil and Environmental Engineering held it's Western Engineering Design Day Competition on Friday, February 13, 2009 in the Great Hall. First Place and overall winner: Telford Engineering: Jeffrey Blaylock, David Hendry, Bradley McKellar, Pauline Sceviour, Corey Voisin. For their CN Bridge-CN4 CPCI girders and RC slab design. Telford Engineering will represent CEE in Western Engineering Design Days – Final Presentations scheduled on Tuesday, March 24, 2009. DeMarco Family Green Technologies Award: Right to Water: Taryn Meyers, Tyler Rosen. CEE International Development students with their portable water purification system design.